Blesa et al. 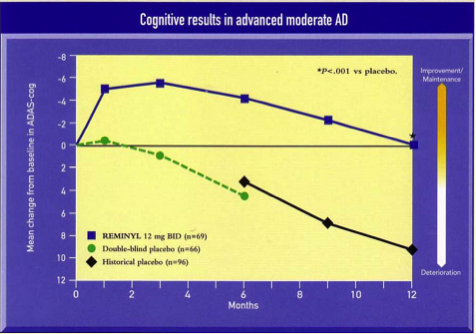 Galantamine provides sustained benefits in patients with ‘advanced moderate’ Alzheimer’s Disease for at least 12 months. Dement Geriatr Cogn Disord, 2003; 15, 79-87. These drugs are expensive, running about $375 per month, although Aricept is now available as a generic–donepezil which can be found at $16 on for a month’s supply online. There are side effects, most often dizziness and lower GI distress in about 10-20% of patients. These side effects are often eliminated by switching among the three drugs. Excelon comes in a patch application which often alleviates all side effects. Namenda, previously described, costs around $400 per month, but is now available as a generic–memantine is used twice per day and costs about $45 for a month’s supply. It's used as an anti-inflammatory agent that is, hopefully, neuroprotective. This is still theoretical, but as it has few side effects the drug is thought worthwhile.